This species has a very wide natural range, taking in parts of Colombia, Peru, Bolivia, Brazil, Paraguay, Uruguay and Argentina. It’s been recorded in the main Amazon basin and numerous smaller rivers including the Rio Orinoco, Rio Uruguay, Rio Paraná and Rio Paraguay. Depending on locality, up to 36″/90cm across the disc. This would be exceptional in the aquarium, although many captive specimens top 24″/60cm. An adult or pair will need a tank measuring at least 96″ x 36″ x 30″/240cm x 90cm x 75cm/1700 litres. One potential pitfall when keeping more than one species of Potamotrygon together is that most will hybridise freely. Given the potentially precarious conservation status of some species this really should be avoided wherever possible. More recently there has been a somewhat alarming rise in popularity for the so-called “bat” or “batman” rays. These are the result of a genetic defect and have certain parts of the disc missing, usually at the rear edge and the area around the head. When viewed from above these do indeed resemble the sign of the fictional superhero. 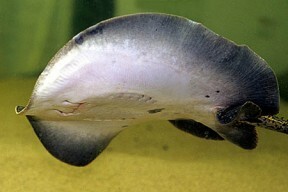 P. motoro is one of the most popular members of the genus with aquarists. Whilst it is quite easily obtainable and hardy once settled in, it does grow very large so make sure you can house it adequately long term. It should also be noted that the males of this species are among the most violent when in the mood for spawning and females can end up on the wrong end of a serious beating. If you’re keeping a pair or group of these keep a close eye on proceedings and be prepared to separate them if necessary. The patterning of P. motoro is highly variable. Some of these variants have been given their own P numbers (listed above), whilst others are sold under trade names such as P. motoro “blue”, “orange”, “black” or “marbled“. The latter in particular is a stunning fish and tends to cost a bit more than the standard form. P05, or P. sp. “B” has also been tentatively named P. sp. aff motoro. 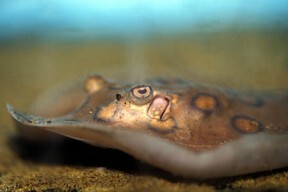 Worryingly there are a number of rays appearing on the market that seem to be hybrids of this species with others in the genus. We find this process abhorrent, and urge you not to buy these genetic misfits with the hope of stifling their popularity.